A Dietric-bodied 1932 Packard Custom 904 stationary coupe owned by Gene and Sally Perkins of Greenwood, Indiana, was awarded best of show. A Dietric-bodied 1932 Packard Custom 904 stationary coupe owned by Gene and Sally Perkins of Greenwood, Indiana, was awarded best of show at the 39th annual Ault Park Concours d’Elegance in Cincinnati while a 1967 Ferrari 275 GTB Spider owned by Brad Jaeger of Charlottesville, Virginia, gained the Esprit de Sport trophy. 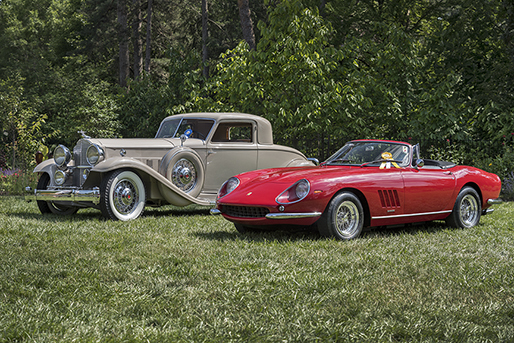 Other leading awards included“An Italian Icon” to a 1962 Ferrari 250 GTO owned by James Jaeger of Cincinnati; the Hagerty Youth Judges Choice was a 1941 Indian four-cylinder motorcycle owned by David and Beverly Corsmeier of Milford, Ohio. The Ault Park Concours brought together over 200 collector vehicles to benefit the juvenile arthritis programs of the Arthritis Foundation. Special displays at the concours featured 100 years of BMW, the cars of Donald Healy, the all-American workhorse- the pickup truck, and the Ford GT40 to celebrate the 50th anniversary of the Le Mans win.